This exhibition framed the year 1913 as an important transitional marker in terms of the development of Australian society. It was a period of cultural confidence and innovation. The themes of the exhibition included nation building, Australia’s first peoples, Australian style, music of the year, moving images, the ‘Australasian Empire’ and defending Australia. Australian society of the period was examined in detail including their working, home and cultural lives, education, health, leisure, recreation and public celebrations. The exhibition evoked a realistic and vibrant sense of the material and an aesthetic experience of the period. It conjured a sense of excitement, positivity and modernity through an energetic streetscape populated with vehicles, period mannequins and smaller objects. These elements were enhanced with set-work including a Federation arch, bunting, and cobblestone flooring. Multimedia reinforced the atmosphere with “windows” to period footage, a cinema setting and operatic audio-visual elements. More intimate spaces were created to explore the themes and related objects in further detail. A highlight feature of the exhibition was a “funfair” component that encouraged visitors to pose for photos on a paper-moon set with hats of the age or to dress large magnetic dolls with period clothing. 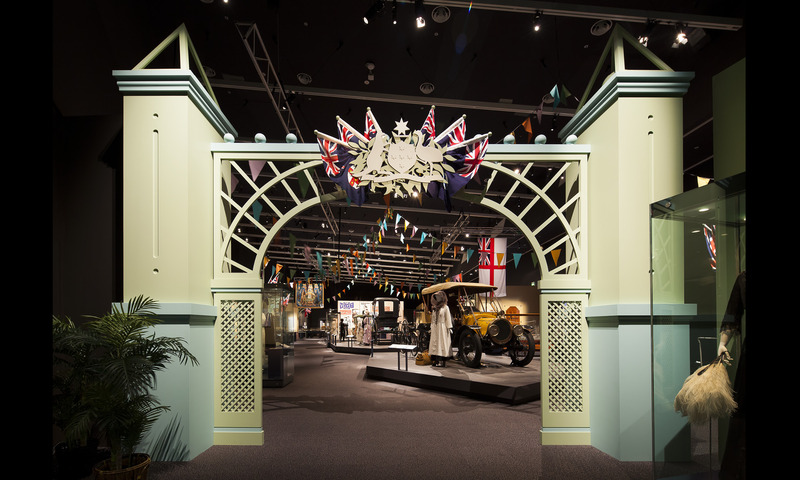 Glorious Days was a flagship project for The National Museum of Australia in the Centenary of Canberra celebrations.